Jalan Dato’ A.S. Dawood, Seremban. THIS Ramadan, tried and true Malaysian favourites are once again on the menu at The Royale Bintang Resort & Spa Seremban with a daily rotation of more than 100 dishes at the buffet. The culinary team at the hotel’s Asiatique restaurant is whipping up time-honoured traditional dishes for the breaking of fast buffet spread until July 16. Themed Ratusan Resipi Istimewa or Hundreds of Special Recipes, the extensive spread features not only Malay festive dishes but curries and stir-fries from the Indian, Chinese and Peranakan community. Chef Ahmad Mahamod said the spread reflected a truly Malaysian menu with classic dishes from Malay gulai kawah (curry cooked in a large wok) to Peranakan Ayam Pongteh. “Ramadan is one of those times when customers prefer if we stick to the tried and true recipes instead of experimenting with exotic flavours. 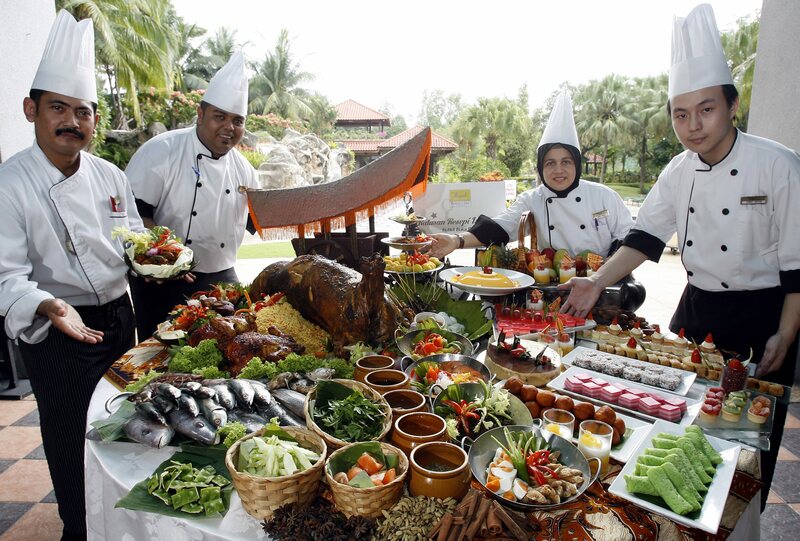 Themed Ratusan Resipi Istimewa, the Ramadan buffet spread at The Royale Bintang Resort &Spa showcases Malaysian favourites such as roast lamb, nasi briyani and a variety of homestyle dishes that represent the country’s multicultural heritage. “Repeat diners often ask for traditional kampung-style dishes or dishes that remind them of their childhood,” he said. Among the popular requests that are back on the menu are Gulai Kawah Tulang Rawan (beef rib curry), Bubur Lambuk Berempah Asli (spiced rice porridge with minced beef), apam balik (pancake with filling) and the hotel’s signature whole-roasted lamb. “These are the must-haves on the menu every year as they are our guests’ favourites. “Gulai kawah is commonly prepared when catering for groups of people like during festive occasions in the kampung, where a large kawah (wok) is used for cooking the various curries or stews,” said Ahmad. Other kawah-prepared dishes offered on the menu include Sup Kambing Berempah (spiced mutton soup) and Sup Ekor (oxtail soup). Another Ramadan staple is bubur lambuk – rice porridge usually eaten at the breaking of fast. The hotel’s signature bubur lambuk is a firm favourite with repeat guests who usually line up for seconds. Ahmad said the rice porridge flavoured with spices, herbs and coconut milk was adjudged the best at a bubur lambuk cook-off in Kuala Lumpur in 2013. “Bubur lambuk is a simple yet hearty dish which serves as a starter for the breaking of fast. “Our version includes minced beef, which gives the otherwise simple dish a meaty bite,” he said. Also on the buffet are flavours that evoke the nostalgia of grandma’s kitchen and village feasts. They include Daging Salai Mangga Muda – smoked beef cooked with unripe mango, Keli Tempoyak Pucuk Ubi – catfish cooked with fermented durian flesh and sweet potato leaves and Daging Dendeng Berlada – an Indonesian-inspired dry curry made with thinly-sliced beef and plenty of chillies. 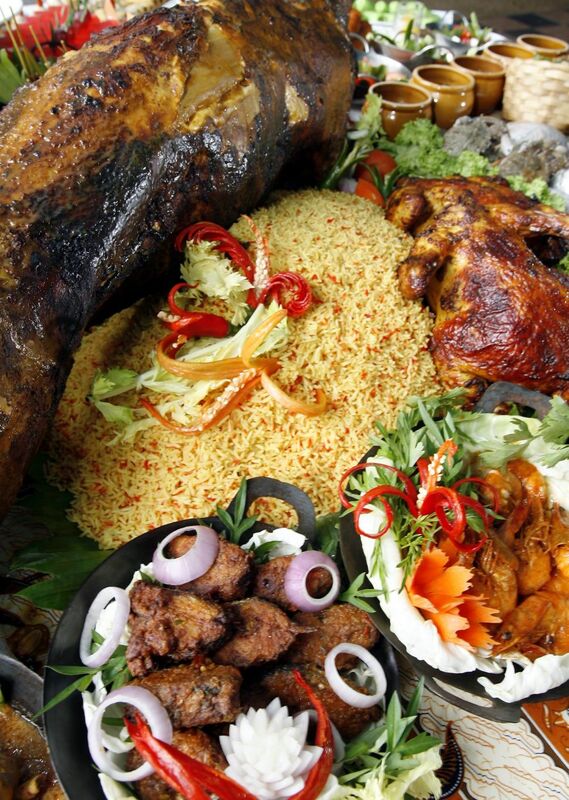 No Ramadan buffet is complete without whole-roasted lamb, a fail-safe crowd-pleaser. At Asiatique, the meat is marinated for an entire day in a secret blend of herbs and spices before it is slow-roasted in the oven until fork tender and then served with a choice of three sauces: barbecue, black pepper and rosemary. “Malaysian cuisine features a range of influences and we have tried to incorporate popular dishes from other communities that we’ve grown up with. “These dishes include Kambing Kurma – succulent cubes of mutton cooked in a spice-based gravy and Ayam Pongteh – a Peranakan staple made with chicken, fermented soy beans and potatoes,” he said. To end the meal on a sweet note, be sure to sample the hotel’s apam balik – delicate pancakes filled with sweetcorn and crushed peanuts. The crispy pancakes are prepared a la minute as its best eaten straight off the griddle. From appetisers to soups and stews and an array of kuih, the buffet spread here offers a variety of classic Malaysian dishes that will please any palate. The Ratusan Resipi Istimewa buffet is priced at RM95 nett (per adult) and RM48 nett (per child between four and 12 years).